This dandy brown hit a spoon on a cheater. 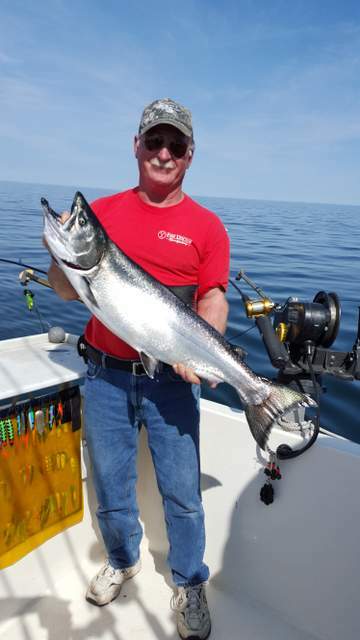 On the morning of May 12, 2016, I watched the #1 rigger rod hammer down hard as a king salmon nailed the silver/red spoon we were fishing on a fixed cheater 10’ above the release. Only 30’ below the boat, it was a violent hit that brought everyone onboard to attention. 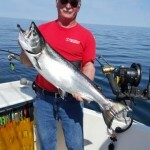 Val boated the king, the last of their 12 fish limit, 11 kings from 5 to 18.5 lbs. and one brown. 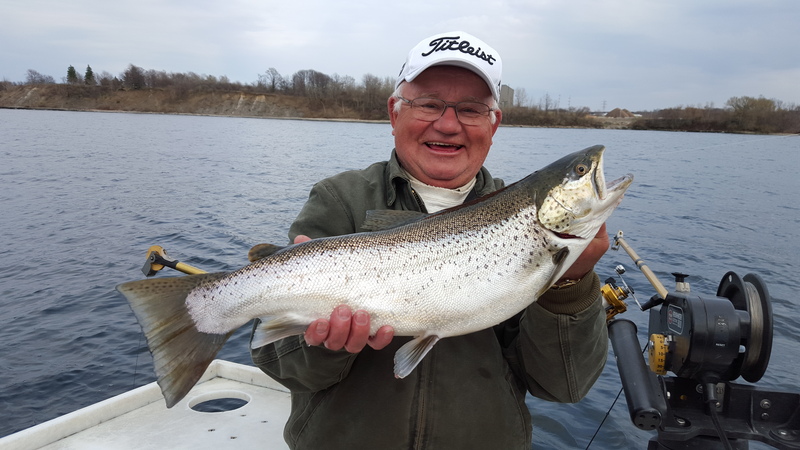 My crew had released somewhere between 10 and 15 other kings from 1 – 4 lbs., plus a lake trout. As usual, cheaters, had added to the catch. Cheaters, sometimes called fixed sliders, are effective anywhere downriggers are used. This rigging technique involves a four to ten foot long leader that is piggy-backed to a monofilament main line hooked to a downrigger release in the standard fashion. The key to the successful use of a cheater is the way it is fished. Leader length and position of the cheater lure in relation to the terminal lure are critical. After 20 years of experience fishing these specialized rigs on Lake Ontario, I prefer to attach cheaters to the main line with an ingenious device called a Liberator, manufactured by Roemer. It is small, attaches firmly to the main line, does not damage abrasion resistant line like Berkley Big Game, and can be easily adjusted to fish any distance above the weight. Correctly attached to the main line, it does not immediately slide on a strike, increasing the chances of a solid hookup. Importantly, when a fish is hooked on the lure at the terminal end of the line, the Liberator automatically releases when the device contacts the rod tip. If the cheater leader is not twisted around the main line, the Liberator simply slides down the line and out of the way. \When using Liberators, fish a main line of at least 15 lb. test, and rig your cheater leaders with the same line. 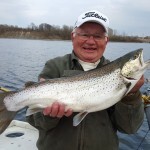 When I am fishing brown trout in the thermocline in July, I am re fishing 15 lb. main line, if water feas allow, and 15 lb. cheater leaders. If the fleas are heavy, the main line is 30# test. This time of year, when I am cheating spoons over dodgers or flashers and and flies, I fish 20-30 lb. test monofilament on both main line and cheater. Just select the leader length you want. Tie a large snap swivel on one end of the leader and a standard snap swivel on the other. Attach the large snap to the Liberator and the smaller snap swivel to the spoon. The basic principle behind use of a cheater is that it not only allows an angler to use two different lures on one line, but also allows two different types of lure presentation, fishing a spoon on a long setback off the mainline and another spoon on a shorter setback off the. The fish will “tell” you which presentation they like best on a given day. If you’re waiting for the king salmon season, wait no longer. The king salmon bite is on! King salmon fishing could not have been better out of Oswegoon the morning of 5/12/16 when my crew of Adirondackers climbed aboard the Fish Doctor and we headed out to deep water where I had located a bunch of kings, cohos, and lakers suspended over deep water. It took a few minutes for the trout and salmon to “warm up”, but when they did, it was steady action all morning. We were fishing a “high, wide, and handsome” program away from all the other boats with megaboards way out and loaded with leadcore sections and copper. It was a spoon bite all the way, with not much attention paid to the dodgers and flashers that were in the water. The result was a limit of kings up to 18.5 lbs. and many small kings released. The speed troll we were fishing was purposely a little hot for browns and lakers, and avoided all but one of each of them. Heck of a king salmon bite for May!